First, let me say that I can't believe it's been over a month since I last posted. Second, let me say that I can't believe it's already been ALMOST a MONTH since we returned home from our glorious jaunt through the northern half of Italy. WHY DOES TIME MOVE SO FAST?! Can I hear an amen? Not a day has gone by since we returned that I haven't reminisced and day dreamed about our Roman Holiday (...see what I did there? But really, we weren't just in Rome). It was fifteen wonderful days of sight seeing, relaxing, eating handmade pasta and gelato, and drinking all the wine we could. The biggest thing we learned from our trip? Old World wines are where it's at! Everyone's got their preferences, and I still enjoy New World, but man, has my love for Old World styles grown. While we were in Siena, we went on two wine tours: a half day tour through Chianti and a full day Brunello tour. Both were great in their own ways, but the thing I liked best was learning about the bio-dynamic wineries in Montalcino. It was so fascinating! As a little background, Montalcino is a picturesque hill town in Tuscany. Brunello is their super star wine (and many consider it to be king in Italy), and Montalcino was the first town to be awarded their "DOCG" designation, or Denomination of Controlled Guarantee in rough English, by the Italian government. All this means is that there are very strict laws and regulations about the wine in regards to grape varieties, methods of production, additives, aging, etc. If you want to see the full laundry list of rules, check out this website by the Consorzio Vino Brunello di Montalcino. So needless to say, the people in Montalcino care about their wine. 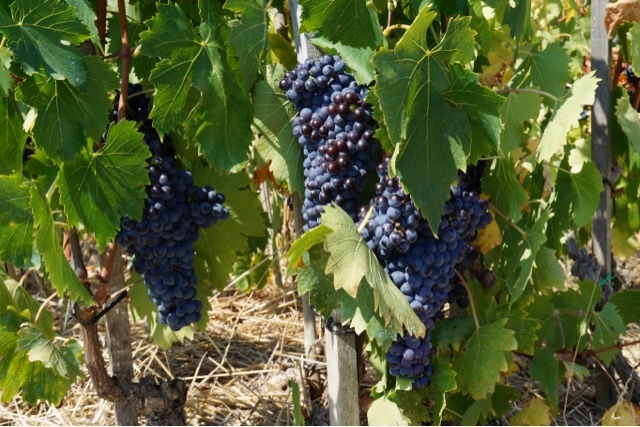 Now for a little background on Brunello, the wine is made from the Sangiovese grape. Its primary flavor tends to be red fruit and cherry, but it can also have flavors of leather and tobacco. It's definitely more savory in flavor than fruity. The wine must be aged for 5 years prior to release with at least 2 of those years in oak by law, but many say that this wine should be aged in the bottle for at least 10 years after release for the flavors to develop and soften. It's a wine collector's dream! Finally, like most Italian wines, Brunello pairs best with food (hello bruschetta and pasta!) because it's high in acidity. We went to two bio-dynamic wineries while on our Brunello tour, but the first, Podere le Ripi, was my favorite. I feel a little bad saying that because the owner has an "unfair" advantage over the other wineries we visited... he is the son of the man who started Illy Coffee so he has a large fortune to work with. Regardless, his wines were tasty and his cellar was spectacular. The tour began with his vineyards. They only have a few hectares that are designated for the DOCG wines, so they grow some other varieties as well. Our guide indicated that this winery puts more vines per hectare in order to have the vines work harder for water and nutrients. They believe that vines that "suffer" produce better fruit, so they planted more than quadruple the number of vines per hectare compared to other wineries. Additionally, they are bio-dynamic, which is most easily described as a more intense version of organic. They do not use pesticides and chemicals in their vineyards or production, but it is also the mindset of working with the earth and the environment to help improve the winery. They plant other crops and pay attention to the position of the moon and constellations for their work in their vineyard. If this interests you, you can read more about bio-dynamic wines in this post by Wine Folly. They then took us to the owner's cellar. The owner believes that metal creates a magnetic field and damages the wine, so they built the cellar without reinforced cement. The entire building was built from clay bricks and limestone mortar all by hand. It was very impressive! The winery also does not use steel tanks to ferment, but uses cement tanks and oak barrels. The cellar is a corkscrew shape so the winery can only use gravity to move wines from phase to the next. The tasting was great, and we ended up purchasing one of their wines that was 100% Syrah. We wish we had bought more, but we had to hedge our purchases since it was our first stop of the day! I hope you enjoyed hearing about our favorite winery stop on our trip to Italy, and if you're ever headed over there, let me know! I love sharing my itinerary.